I never been into bronzing before, as I am pretty pale and every bronzer looks orange on my face. I just wanted to introduce you to my three new lovers, decided that I won't include the Nars Laguna, as it's been featured on my blog so many times and I don't want to keep on repeating myself how much I love it. NARS Contour Duo in Olympia: While browsing at the counter, I came across Nars Contour Duo, I never seen it before so I guessed it was something new. The product is matte, haven't noticed any glittery particles. The powder blends really well on the face. The highlighter is very powdery, and it isn't really illuminating on the skin, I mostly use it to pale out a bronzer if I just apply too much. I also like to use it under my brows. The product is amazing for pale girls! Although I would say it's not really a product that you need, for the price there are many other contouring/bronzer out there. 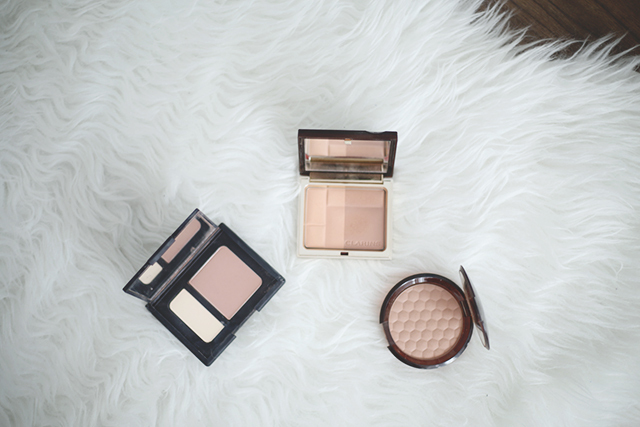 Clarins Bronzing Duo in Light: Ahh this have been on my wishlist for so long! I bought it at the end of the summer. The Left side is more matte, whereas the right side is more glittery, it's a perfect duo once mixed together. I would only use the left side as a contour as it not that glittery, although if you want to add more warm tones to your pale skin, I would recommend using it on the places which the sun would normally hit. Looks absolutely stunning on the skin, easy to blend, is not as powdery as the Nars Duo. The packaging is also really beautiful. The Body Shop Honey Bronzer in Light: Finally something that is a lot more cheaper, I would recommend you to watch out for Body Shop offers before buying it for the full price. This is a powdery products, but once you tap off the excess product from the brush it looks flawless on the skin! It's a matte bronzer, doesn't look orange on the skin. I find it to be really similar to the Benefit Hoola Bronzer. Doesn't have any scent to it. If you on a hunt for a cheap, but amazing bronzer just go for it, you have nothing to lose. I adore my Honey Bronzer, I can't believe I managed to cope without out it previously! Going to take a look at these! Its always good to have something that is lighter for those 'natural' days.